Wow!!! People moving large pieces of furniture on undersized cars are getting just as popular as Peter Parkers on our blog. But is this REALLY what it APPEARS to be? We sent our Jagoff Staff to go find this car. As it turns out, this is NOT someone trying to move a couch by strapping it to the top of a Jeep. It includes 4 pillows (2 of them just for show and 2 of them you can throw on the floor WITHOUT your mother yelling at you), and a self-sucking-cleaning device that cleans your food crumbs from underneath the cushions so you don’t find what equates to an extra large bucket of chips, pretzel rods and cheese curls every other month! There is actually a special clear-plastic-cushion-cover option in case you want to impress your Italian grandmother. 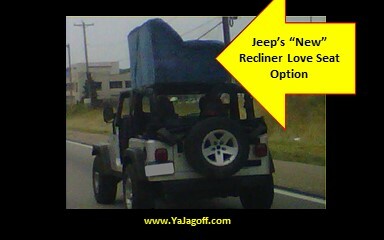 Lease a 2012 JEEP WRANGLER SPORT with Love Seat Package for $299 per month for 39 months. Total due at signing: $2,499. Security deposit included. Hey Wrangler Will, when your parents find out that you stool their love seat just to show the concert chics that you understand the Kenny Chesney “Big Blue Chair” idea, they’re gonna be ticked. Especially if you return it and THEN find out there’s some scary-drunk-tailgating dude sleeping under the cushions along with the with the chips, pretzel rod and cheese curl CRUMBS, Ya Jagoff!! Next articleWho Put All Of the Pins In This Shirt?